Just 10 Minutes from Now You Could be Promoting Your Detoxification Programs to Your Current and Past Patients! If you’re like most health professionals, you tend to spend the majority of your time focused on finding better ways to treat your patients, not on marketing your practice! Yet, you know that in order to have patients to treat, you have to engage in at least some form of marketing, but what do you do and when will you ever have the time for marketing? I can help. I’m Robert Imbriale, a long-time marketing expert who has worked with professionals for most of my decades long career. One thing that I know for sure is that if you don’t put any effort into your marketing, you’re going to have a tough time building a strong and secure practice. But marketing should be easy, it should not take hours and hours of your time, and it should be effective at getting patients to call for appointments. That’s why I have created this “10-Minute Marketing Package” for you. Available for immediate download, these letters are literally copy and paste ready for you to simply add your practice name, phone number, and signature. Within 10 minutes you’ll have a professional marketing piece ready to mail, e-mail, or post that would normally cost you well over $1,500 for just a tiny fraction of that. Whether you are a Chiropractor, Natural Doctor, Nutritionist, Acupuncturist, or other natural health professional who offers detoxification programs, you will be able to use my letters to get your existing and past patients to call and come in for appointments! Professionally pre-written letters you can use to promote your detoxification programs! These letters were professionally written by me and I am a marketing expert who has written thousands of marketing letters over the course of my career - many for health professionals. The concept here is that you will be informing your patients about the detoxification program you offer and letting them know why detoxification is important for them. These are NOT hard-selling, aggressive letters loaded with arm-twisting tactics that can be so abrasive to you and your patients. They are written using a matter-of-fact tone that simply informs and then invites your patient to come into your office to speak with you about a detoxification package. The letters included in this package are ready to use with just a minimal amount of editing. This what I call my "10-Minute Marketing" strategy where you will spend 10 minutes or less with these letters before you can use them! These letters will be delivered to you for immediate download in Microsoft Word format allowing easy editing of your practice name, your name, and the phone number for the practice. Of course, you are welcome to make any additional changes you would like to these letters, but you are encouraged to leave the marketing written into these letters intact. My typical fee for writing these kinds of letters for my clients is over $1,500, which is out of range for many, so I have created this special Detox Marketing Letter Package for you at a price you can easily afford! In fact, this package will pay for itself many times over as you can use it not just once, but as often as you wish for as long as you wish! I believe you've fully pay for this detox letter package if it results in just one additional patient visit for you, but I know you'll likely see many more than just one additional patient visit when you use these letters. You can get the detox letter package for just one small $97 payment! Once you finish checking out, you'll get a download link so you can start using these letters immediately! One of my clients who has used one of these letters told me that they got their first appointment in less than an hour after sending the letter via e-mail. 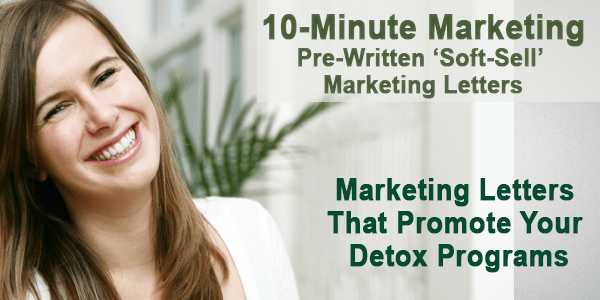 Get the Detox Marketing Letter Package Now! If you don't like what you get, or find that it does not get the response you expected, just contact me at robert@ultimatewealth.com and I'll issue a full refund, no questions asked. I'm sure that you're going to love the results you get using my letters. Bonus: Included in this package are 2 additional pre-written letters you can use either as e-mails or printed and mailed letters to your new and existing patients! These letters are valued at more than $500 each and are included FREE with your purchase today! P.S. If you're not informing your patients about what you have to offer, how are they ever going to ask you about the products and services you offer that might benefit them the most? The detox marketing letter package solves this issue by giving you professionally written, soft-sell marketing letters you'll be using in 10 minutes or less!